The Labor Day weekend is known to many as the close to summer and the opportunity for one last warm weather hurrah. Many use this long weekend to travel, visit friends and family, cookout, and enjoy a day off work. Labor Day weekend is a huge travel time, so it's imperative that we all know how to safely share the roads. Did you know that there will be approximately 336 to 485 traffic deaths this Labor Day weekend? With so many on the road this weekend, I thought I'd take the time to remind everyone of some basic safe traveling tips. In 2010, distraction contributed to 90% of fatal crashes. The most common driver distractions include calling/texting, daydreaming, reaching for something in the car, and rubbernecking. It's said time and time again, but keep your eyes on the road. Many states even have laws these days where it's illegal to text and drive. Labor Day is a big cookout day, and that unfortunately means many people will be hitting the road after a few drinks. Watch for drivers weaving in and out of traffic, and call 911 if you see any drunk driving. 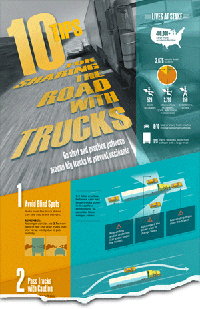 For whatever reason, most people aren't taught about the blind spots on a semi truck when they take driver's ed. It's common to see cars and SUV's driving down the interstate alongside a semi truck, but this is a terrible idea. You see, trucks have four big blind spots, and if you're in any of them, the driver can't see you. A truck's blind spots are located in front of the truck engine, behind the trailer, and along both sides of the trailer. Keep this tip in mind: if you can't see the trucker's mirrors, s/he can't see you. A truck driver's most common gripe is when a car or SUV zips right in front of them, forcing the truck driver to brake quickly. It's a behavior that baffles truck drivers everywhere -- why would you cut RIGHT in front of an 80,000 pound vehicle then slow down? Guess where that truck's going to go if you brake too hard too quickly -- that's right, into your car's bumper. Seems like a bad idea to me. When you're out traveling and visiting with loved ones this Labor Day, remember what the holiday is for and thank the next truck driver you see for everything they do for us! Start YOUR Truck Driving Job! Driver Solutions' company sponsored CDL training program helps entry-level truck drivers get the experience needed to find a trucking job with no upfront tuition cost. Fill out our no obligation online application to get started. Filling out an application does not commit you to anything, but allows you to schedule a time to speak with your Driver Agent about your options.